as per NWMSU tonight's game is already sold out. Doesn't that gym seat like 2,000 fans? Not hard to sell that place out. Now if Ft Hays or UCM were sold out. It would actually be impressive. Speaking of, is NWMSU ever going to build a new basketball facility? Unfortunately a new facility probably isn't coming. And I think NW could sellout a bigger arena is this situation. Bearcat Arena hold 2,500 according to Wikipedia. They lie lol. It was overcapacity at 2,200. Capacity is probably 2,000.
sure they could...could probl sell 3x the tix for a regional final....but you don't build a new arena for one game....which, obv i know you know that & weren't saying otherwise. I'll be one of them! Taking off in 5 mins! 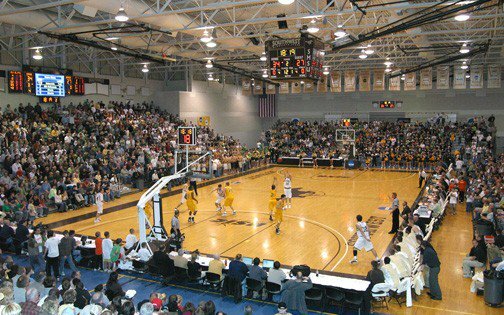 Building a new larger BB facility for NW would be crazy when attendance average of around 1200. Especially after the Bearcats win a National Championship this year, McCollum takes a low-major D1 job this offseason, Pitts decides to forego his senior year to play pro ball in Europe, and the program experiences a gradual-but-painful decline over the next several years. Hence the "(Kidding Bearcat fans.)" at the end. And the smiley face. Honestly, once Pitts is gone, I would hope this is a rivalry that continues. As Billeter noted I think in the post-game press conference, the Vikings have played NWMSU more times in the past 3 years than several, if not most, of our North Division in-conference opponents. It's a fun matchup, especially with such clashing styles. Unfortunately, we didn't have the talent this year to overcome NWMSU's talent, but it'll be fun to see how things shake out over the next few years if the Augie/NWMSU matchups continue. if memory serves me the old wooden bleachers held between 2500-3000. As Billeter noted I think in the post-game press conference, the Vikings have played NWMSU more times in the past 3 years than several, if not most, of our North Division in-conference opponents. I love fun facts like that. Probably not, but is there any possibility for seat expansion in the current arena? Plans are in place for an indoor facility. At that point the indoor track in the arena would no longer be needed and they could expand seating but not sure if that's in the long term plans. I'm confused, how would that help expand the seating? Does all the seating stay as-is during the week when there aren't games? do they want to build suites or something? It is? I don't know what the standard for fine is in the MIAA, but up here it would be middle of the pack, at best.